Extrae instantáneamente las contraseñas de las cuentas de varios servicios de mensajería instamtánea. ¡Obtiene los datos de cuentas de más de 70 mensajeros populares, tales como AOL, ICQ, MSN y Yahoo! Es compatible con: más de 70 servicios de mensajería instamtánea, incluyendo ICQ y ICQLite, AOL Instant Messenger, AIM Triton, AIM Pro, Yahoo! Messenger, Excite Messenger, MSN Messenger, Windows Live Messenger, Microsoft Lync 2013, Microsoft Office Communicator 2005, Google Talk, Trillian, Trillian Astra, Odigo, AT&T IM Anywhere, T-Online Messenger, Match Messenger, Jabber IM, Miranda, Tencent QQ, QQ (Versión para África), Picasa Hello, QIP Infium, Gadu-Gadu, Mail.Ru Агент, Microsoft Lync 2013 y muchos otros. Advanced Instant Messengers Password Recovery instantly retrieves the login and password information protecting user accounts in various instant messengers. Currently supporting over 70 different instant messengers, Advanced Instant Messengers Password Recovery is undoubtedly the most universal product in its class. 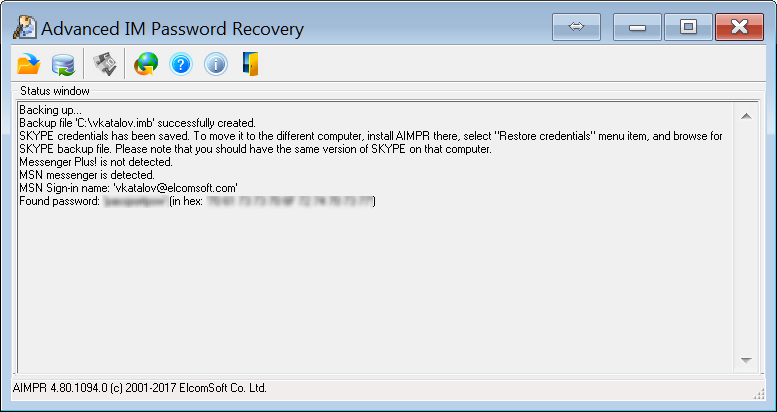 If there is more than one account in the system, Advanced Instant Messengers Password Recovery recovers all passwords. A few modern instant messengers, such as ICQ version 6 and higher, Yahoo! IM version 7.5 and up, and all versions of Skype, never store password information anywhere. Instead, they perform a one-way transformation of a password, creating a secure hash that is used to authenticate users with IM servers. Instead of performing lengthy attacks on these passwords, Advanced Instant Messengers Password Recovery offers an ability to back up and restore such passwords, effectively allowing transferring IM accounts and settings from one PC to another without knowing the original password.